Susan I. Spieth grew up in New Hampshire and began West Point in 1981. She graduated and was commissioned as a Second Lieutenant in 1985. After serving five years in the Army as a Missile Maintenance Officer, she earned a Master of Divinity degree from Ashland Theological Seminary in 1994. She served five churches as Pastor/Associate Pastor for seventeen years. Susan and her husband have two adult children. 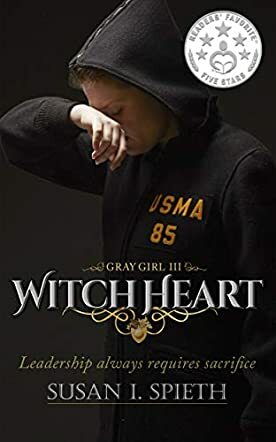 Witch Heart: Gray Girl Book 3 by Susan I. Spieth is a mix of the author’s real life events and a suspense-filled mystery. The main character, Jan, is entering her training at the Army Airborne School at Fort Benning. With few other options to get an education without sinking into debt, she is determined to do her best and graduate from West Point. Despite the issues of the previous year, she faces the challenges and her rivals with stubborn grit. Though she has her friends by her side, someone is stalking her and others are trying to get her dishonorably discharged. Are they one and the same? Or is she a witch who attracts trouble wherever she goes? Though Witch Heart is not the first book in Susan I. Spieth’s Gray Girl series, it did not take me long to mostly catch up with the story. There were a few things I would like to clarify, so I would recommend reading the previous books first, but the writing is so good that it is easy enough to enjoy Witch Heart on its own. The journey that Spieth describes for Jan is filled with realism and frustration as she weaves in misogyny, bigotry, and betrayal. I can’t say that I always liked Jan and her friends, especially certain comments they make about one of the other soldiers, but I don’t know the exact nature of their history with her, as they happen in the previous books. Despite not always liking the characters, the writing kept me wanting to know more and follow them to the end, proving that not all main characters have to be likeable for readers to enjoy a story.